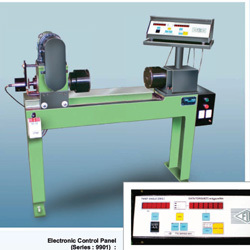 Torsion Testing Machine is designed for conducting torsion and twist on various metal wires, tubes, sheet materials. Torque measurement is by torque transducer system. Torque can be applied to specimen by geared motor through gear box. Autographic recorder gives the relation between torque ang angle of twist. The accuracy of torque indication is ± 1% of the true torque. Front Panel membrane type key board for test setup. 7segment digital display of load displacement/extension. Serial port communication with PC. 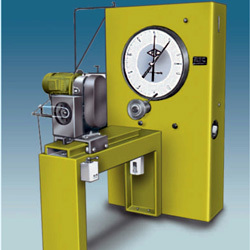 Storage of important parameters such as peak load & maximum displacement after test. Preload selection to take care of initial slippage. Optional real time graph & PC software. Equipped with 100 N-m torque cell which provides higher accuracy of torque. Self-aligned gripping device for any specimen. PLC based instrumentation to measure.